Before this trip, and even before we met each other, Marko and I had traveled to quite a few countries. We both love to travel, have visited wonderful places and had great adventures on our own, so when choosing a destination for a 6 months trip, we wanted to go somewhere interesting and new for both of us to discover. After some debate and a lot of research, we came up with exploring South America. This almost forgotten continent for tourists and travelers, where information is hard to find and the best deals are always in spanish, was the perfect destination for a landscape photographer and me, who even when I was born and raised in Argentina, I have to admit I know Europe or Asia much better than my own part of the world. Once we had decided the continent and knew our budget, we started to think more specifically about the trip and soon realized that we had a few other limitations that we should consider when choosing our destinations to make the most out of them: Time, Distances and Seasonality. Then we divided our trip in independent units or parts focusing on different areas that we will be visiting. This way is much easier to plan each step, know how much time we need for each part and where we have room for adjustments in case of unexpected detours. To estimate how long we would be in each part, we used an app called Furkot which allows you to plan road trips taking in consideration not only distances and speed limits, but also breaks and overnight stays which makes it easier to know how long will it really take to go from one place to the other as it calculates departure and arrivals dates too, including any stops you make. As I mentioned before, in South America distances are vast and it takes time to go from one place to the other. I never realized how far everything is until I moved to Europe. 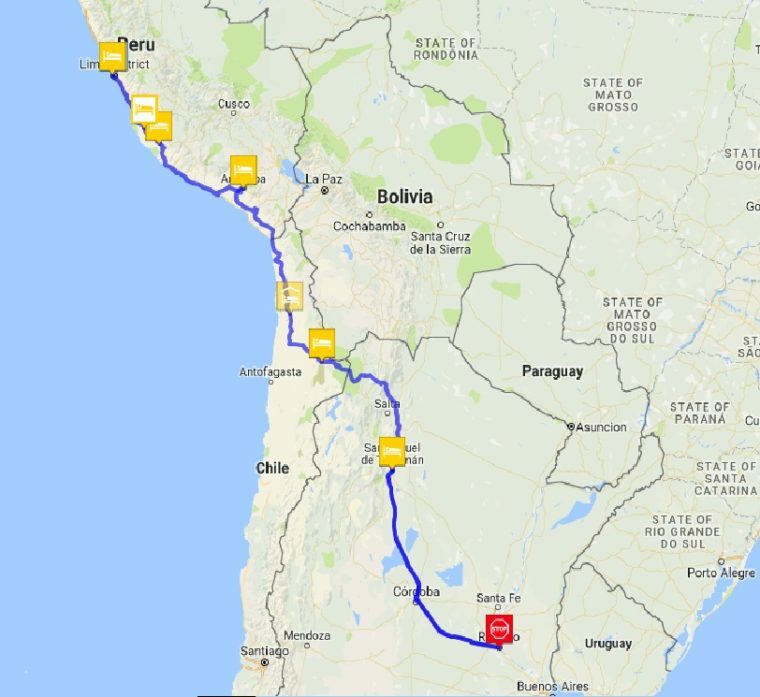 For us in Rosario (my hometown in Argentina) the closest international airport is 320KM away in Buenos Aires, while in Europe that’s more than the distance between Berlin and Prague (280KM). Another problem is that there are no low-cost airlines and few cities have working airports, which are usually capitals and far from the most spectacular places these countries have to offer. Then traveling by land becomes the best (and maybe only) way of exploring this area. It can be done using the bus system, which many are available with a full-bed option which are great for long overnight trips to save time and accommodation money, or by car. This means that you will need to invest days only in travelling to get from one spot to the other, limiting even more the places you can visit. We decided to do this trip mostly by car as the cost for two people and the freedom it provides made it very convenient for us, especially for travelling in nature where you can go off-road and reach remote places, not to mention being able to carry all Marko’s photographic equipment with no problems. 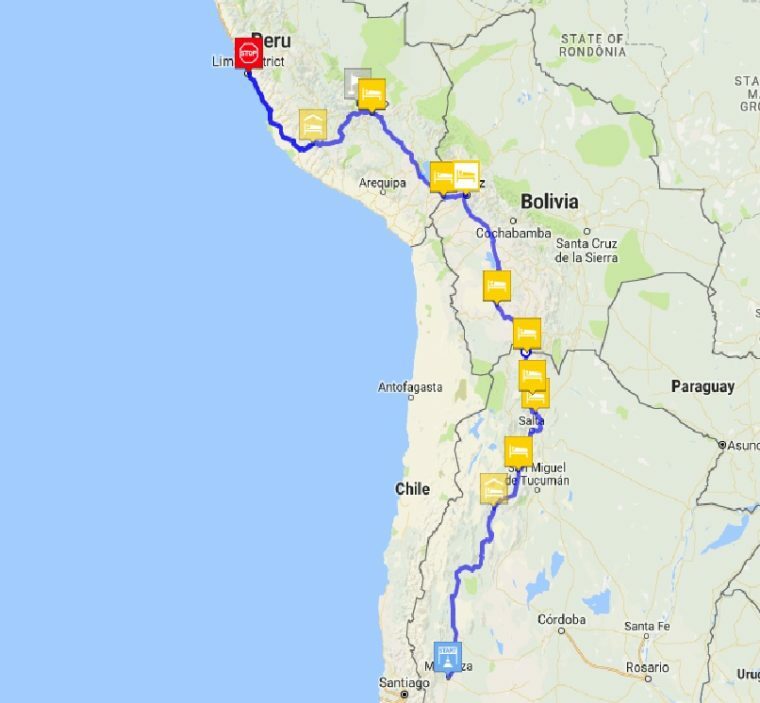 But for some destinations as El Calafate, Ushuaia, Iguazu falls or Iquitos, we could take other means of transport as overnight buses, ferries or planes to save some time as the drive would be too intense. 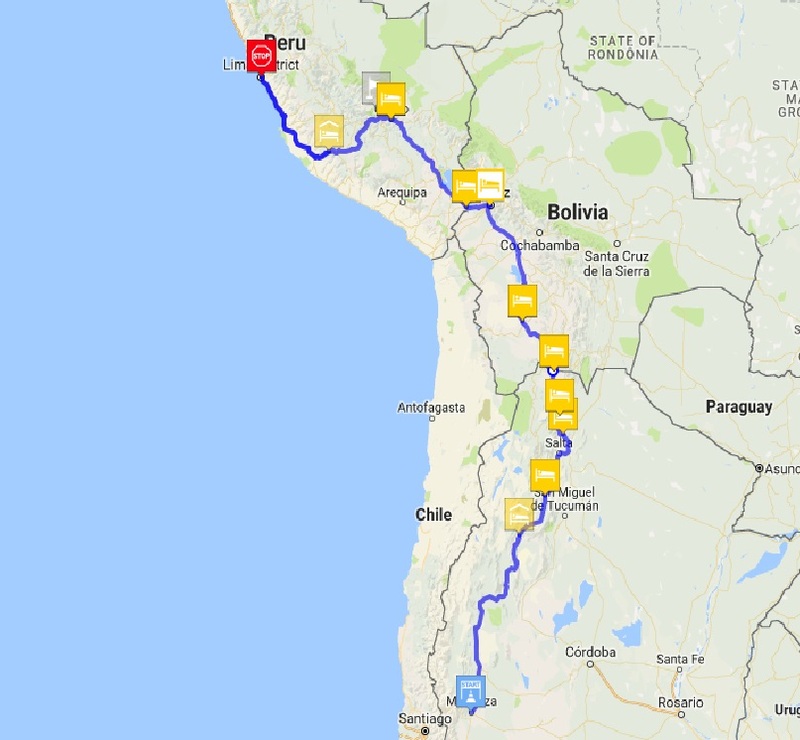 Once we knew the general regions we would visit, we started adding all the places we were interested in visiting to try to find the best routes possible or if something had to be cut out from our itinerary as it was too far away. This is what happened when we were trying to figure out how to go to El Calafate, which is 1500KM from Bariloche, the southest point we are reaching by car during Part I of our trip. 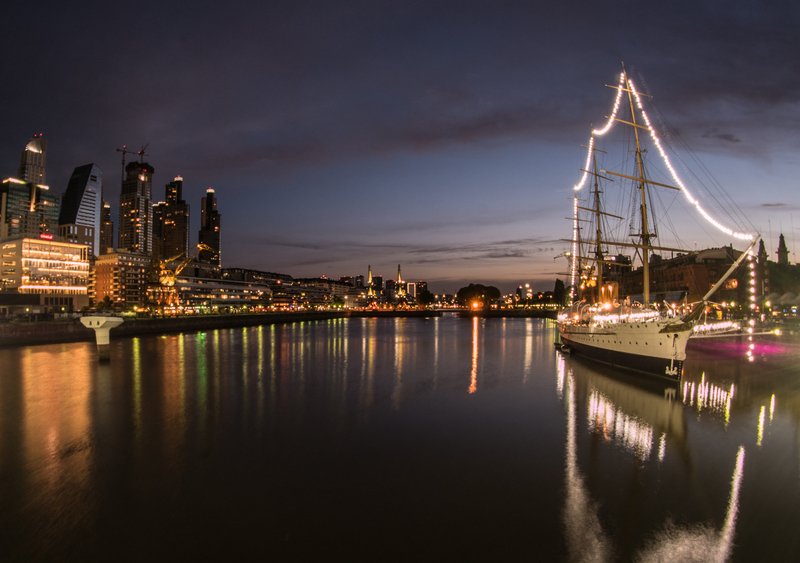 But as we weren’t going to miss one of the most important places in Argentina, we decided to take a plane from Buenos Aires at the beginning of our trip. We couldn’t have made this decision if we hadn’t had an idea of how far and long it would take us to drive down there. Think of time the same way you probably think of money, and make a budget for it. As time is limited, it is important to know where you will be spending most of it, which in South America might be driving a car or waiting for a bus if you don’t do it right. The weather can be your biggest ally or worse enemy when it comes to traveling as it can affect your whole experience. That’s why we checked average temperatures and seasonal characteristics of the places we will visit. 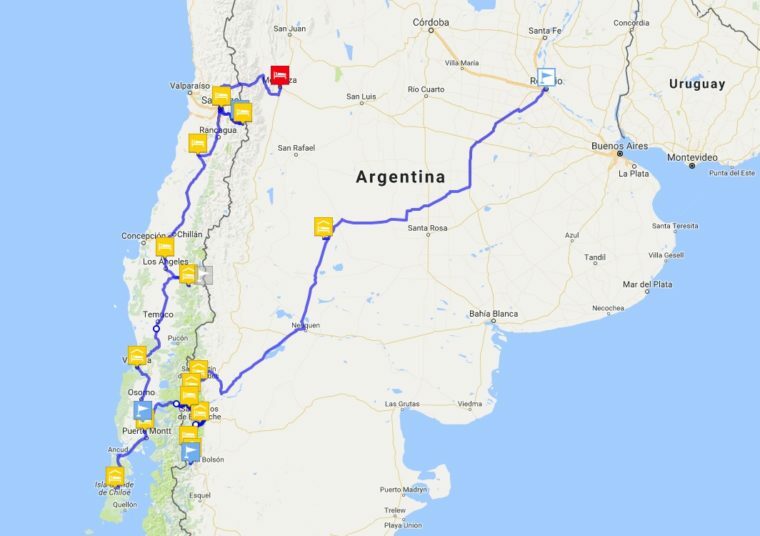 As our trip is starting in January, during the middle of the summer, we had to consider that some places in the north could have been too hot with temperatures that can reach 40´C, while in the south of Argentina, where is usually cold all year round, the temperature would be perfect for hiking on the mountains (around 10´C) while later in the year could be too cold for this. Another example is that from January to March is the rainy season in the Bolivian Salt Flats, which is recommended to avoid for visiting the area. While the best months to visit the Peruvian jungle are April and May. With this information we built our road trip and made the pieces fit together like a puzzle. Searching the weather conditions online is easy, making the trip fit them needs a little bit more thinking. We know our plans will most probably not go as expected, but the purpose of making an itinerary is not to have everything perfectly organized and kill spontaneity, but to get a chance of studying the areas we will visit, find those hidden spots we would regret missing later and have an estimate budget ready to know where we can afford extraordinary expenses and where we need to be careful with prices. Also is a way of travelling while you are stuck at home waiting for the day you can actually board that plane to start your adventure. Depending where you come from, you might need to get a visa for some countries in South America, which you can check here or you might need to have the yellow fever or rabies vaccines, which you should check with your doctor or in Germany the Tropen Institut of any city. If you have any questions, tips of places you think we shouldn’t miss or just like the post, please leave a comment below and I’ll reply as soon as possible! What would like to read? I want to express some appreciation to you just for rescuing me from this setting. Because of researching through the world wide web and getting advice that were not powerful, I figured my life was done. Existing devoid of the strategies to the issues you have solved through your short post is a crucial case, as well as ones which could have negatively affected my career if I hadn’t discovered your blog. Your good skills and kindness in maneuvering all the details was vital. I’m not sure what I would’ve done if I had not discovered such a subject like this. It’s possible to now look forward to my future. Thank you so much for the skilled and sensible guide. I will not be reluctant to endorse your web blog to any person who needs guidance on this situation.